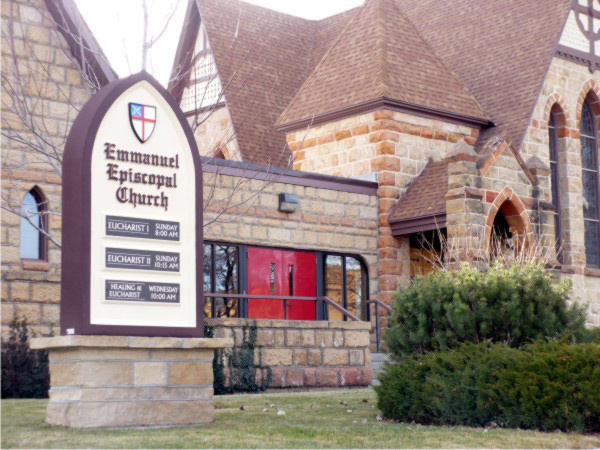 When the Emmanuel Episcopal Church of Rapid City, S.D. desired new signage that would not only match, but compliment the classic lines of their historic building, they contacted Unique Signs Inc. of Rapid City, S.D. Unique Sign’s design was a display that would perfectly compliment the building. With design in hand, Unique Sign immediately called Signs By Benchmark, knowing that its team specialized in creating made-to-match signage. Because the flexibility of its cellular plastic medium allows Signs By Benchmark artists to craft custom products, the project was made to order. The 3′ 10″ wide x 7′ 1 1/2″ high sign features fine stucco finish. The 12″ high logo and letters ranging from 3 3/4″ to 5 1/4″ high are coated directly into the sign face to achieve solid durability and eye-catching contrast. Prior to mounting the sign on a stone base constructed to match the building, Unique Signs installed removable panels with vinyl lettering that will be used to announce church functions. 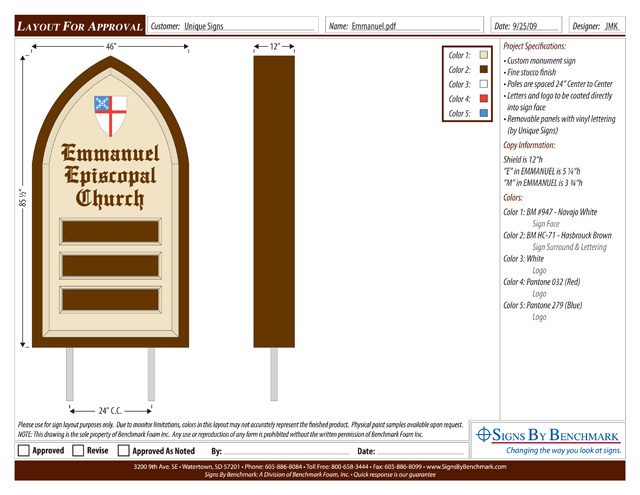 Call the Signs By Benchmark team at 800-658-3444 about your upcoming sign projects. 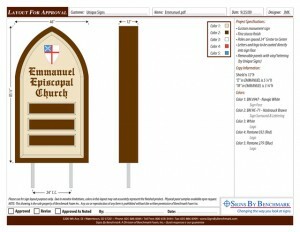 They can create the exact signage your designs call for or provide design assistance if needed.